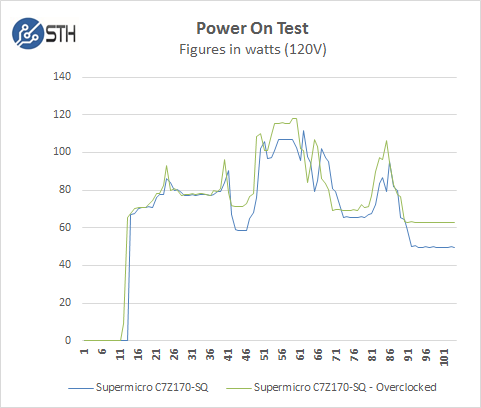 Not long ago we had a look at Supermicro’s C7X99-OCE motherboard and it impressed us with features we would not normally find on a Supermicro board that includes new UEFI BIOS and robust overclocking features. 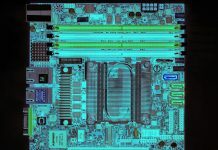 Learning from the progress made on this board now leads us to a another new milestone from Supermicro, the C7170-SQ which enters into the enthusiast/workstation class board with its Single Socket H4 (LGA 1151) and Intel Z170 chipset. 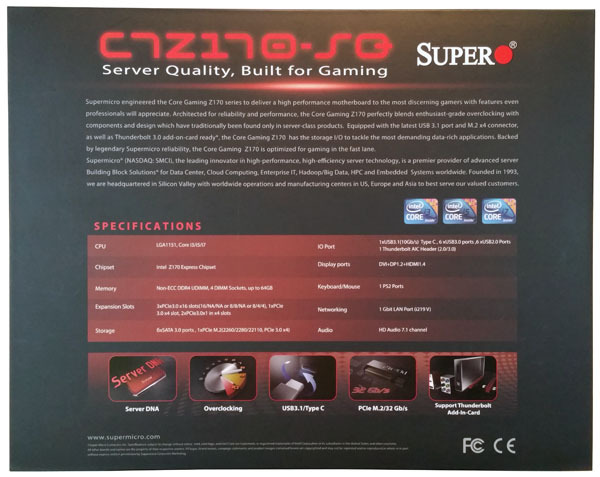 With new retail box art and sporting a classic enthusiast motherboard design the C7170-SQ breaks the mold for what we would consider a normal motherboard from Supermicro. The new box art design offers good retail shelf appeal with beveled edges and metallic gray slip cover. Front and center is the motherboard model that has red highlights that show through the text cutouts. 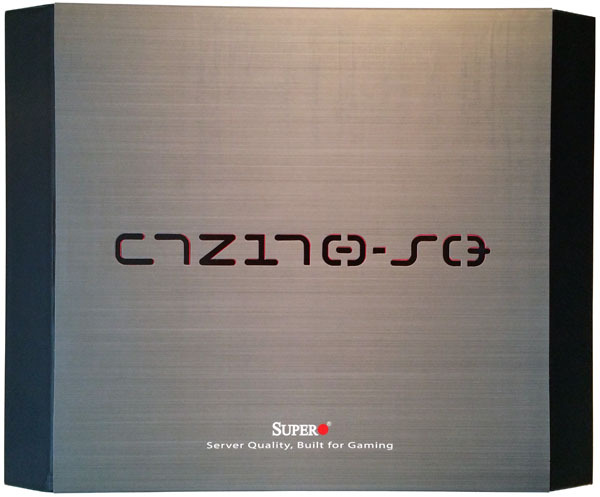 The retail box has a quality feel to it that also supports the quality of the motherboard that uses server grade components. The back of the box shows key features and specifications in an easy to read format. Sliding off the gray slip cover and removing the outer box lid we can now see the package accessory loadout. The first item we would see if the motherboard wrapped in anti-static bag which we removed and opened the box lid. 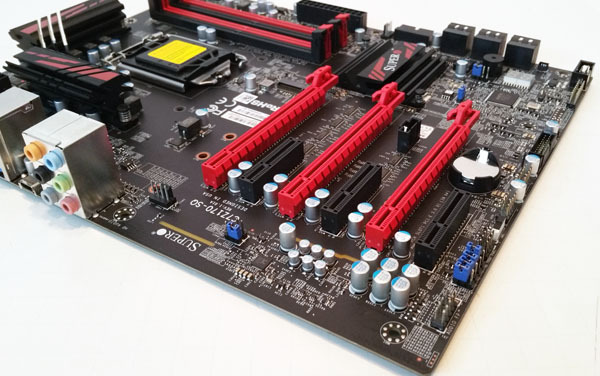 Breaking away from typical Supermicro color schemes we find a flat black board with red highlights on key accessories like RAM and PCIe Slots. At the back of the board just under the sound circuits and Supermicro logo are two tan bands that light up red when the motherboard is powered on. These look very good the odds are at least one will be covered up with GPU’s providing lighting effects between the motherboard and GPU(s). 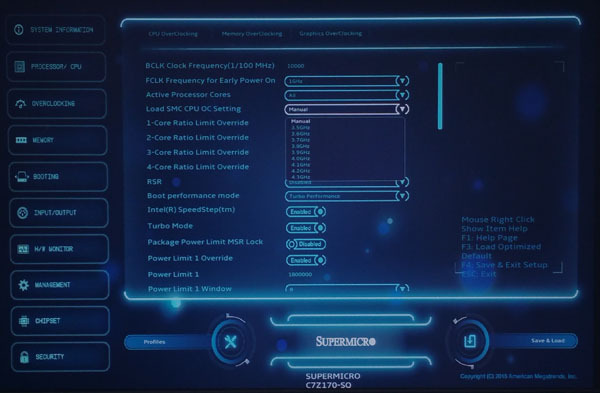 Supermicro includes some industry standard features on his motherboard like physical power and reset switches on the motherboard as well as a POST status LED. 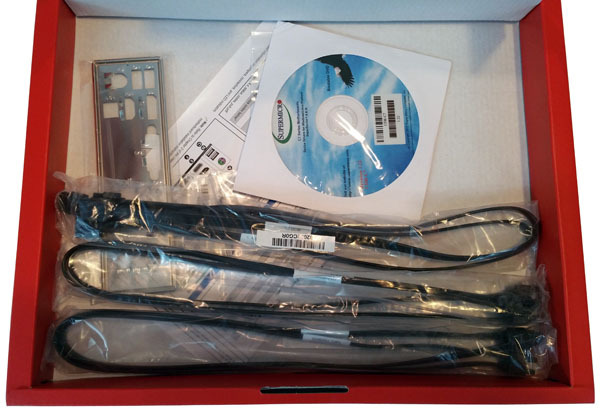 Now we are looking at the back storage ports which are 6x SATA 6Gb/s port(s), black. These support RAID 0, 1, 5, 10 via the Intel PCH. The PCI-E 3.0/2.0 (Red) slots run at 16x/0x/0x, 8x/8x/0x, or 8x/4x/4x for 2-way or 3-way CrossFireX, SLI is not supported. 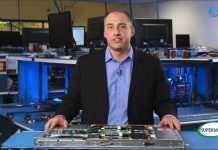 Between the CPU and top red PCIe slot we find the PCIe M.2 for installing popular m.2 form factor SSDs. Let’s move on to take a look at the back I/O ports. Looking at the back IO area of the C7Z170-SQ we find PS/2 keyboard/ mouse, 2x USB 2.0, HDMI, VESA Display Port, DVI-D, 2x USB 3.0, 1Gb LAN, USB 3.1 Port 8, Type-C and audio inputs/ outputs. There are six mini jacks for onboard audio in/ out as well as an optical S/PDIF output. We can also see that the HDMI and Display Port ports appear to be gold plated which is a nice touch. 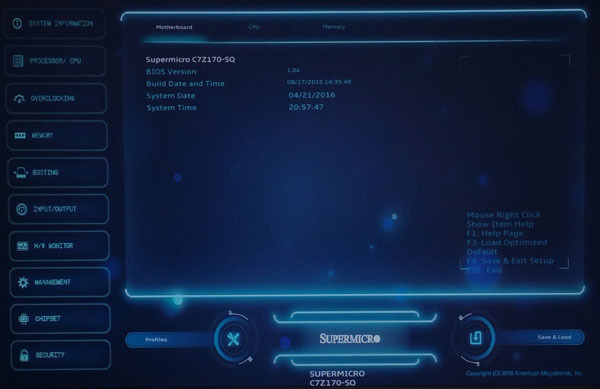 Supermicro has taken huge steps at improving the BIOS user interface and we think this version is the best we have seen from SM thus far. Navigating the BIOS is simple and easy to find your way around, this version is a big improvement over the GUI we saw on the C7X99-OCE. The C7Z170-SQ has all the knobs needed for overclocking, we simply selected 4.0GHz from the drop down and ran our tests with that. It proved to be very stable and did not need any extra voltage adjustments. 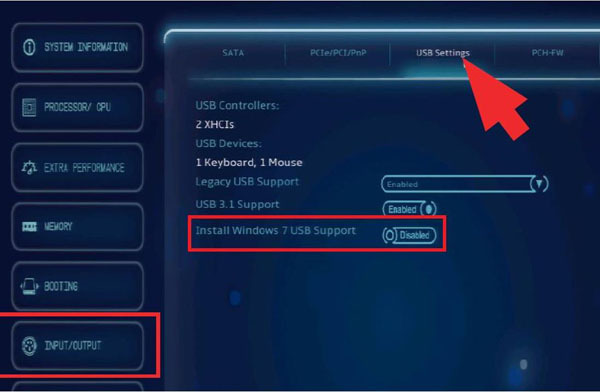 Installing Windows 7 on Z170 motherboards can be an issue, these problems are related to a lack USB 3.0 support on the Win 7 install disk, you will get as far as the install options and you will lose mouse/keyboard controls. To get around this other boards require you to play a few games such as creating a new Win 7 ISO that includes USB 3.0 support by nLiting drivers for support. 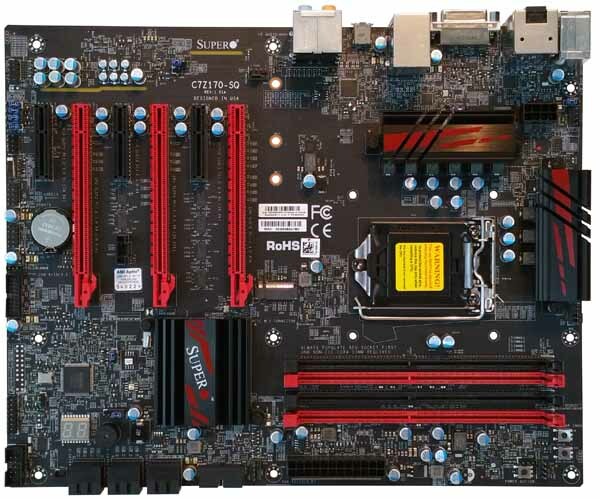 However, the C7Z170-SQ has the needed fix built right into the motherboard BIOS. You can select these features and continue on with the Win 7 install and when that is finished simply disable these features and you will be good to go. 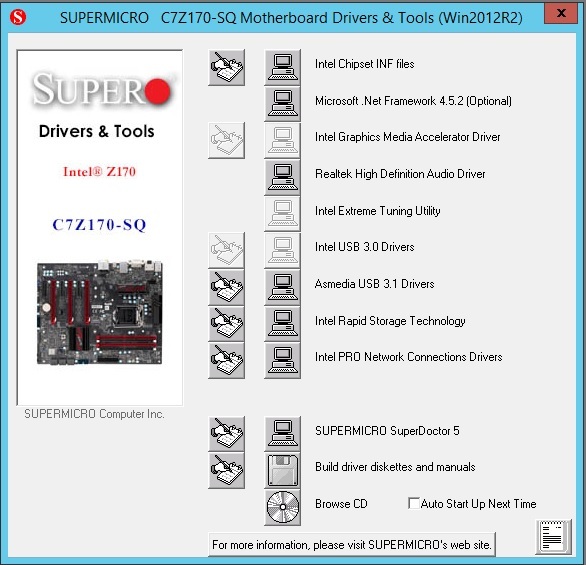 The driver support DVD that comes with the C7Z170-SQ is typical of Supermicro disks and includes everything you need to get your system up and running. We used our standard test components and built a workstation around the C7Z170-SQ. We ran our tests with both Default BIOS settings and then again with an overclock set to 4.0 GHz, our Noctua NH-U9DX-i4 heat sink handles these settings very well. 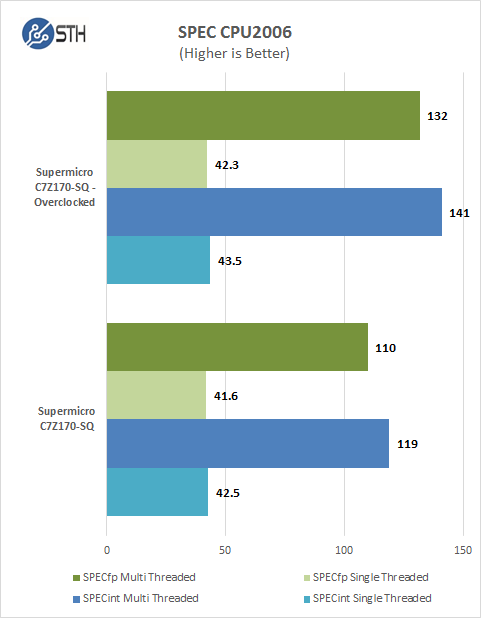 Memory Latency ranged at about 62ns and we saw no real change with overclock settings, we did not adjust the BCLK which would have boosted memory performance. 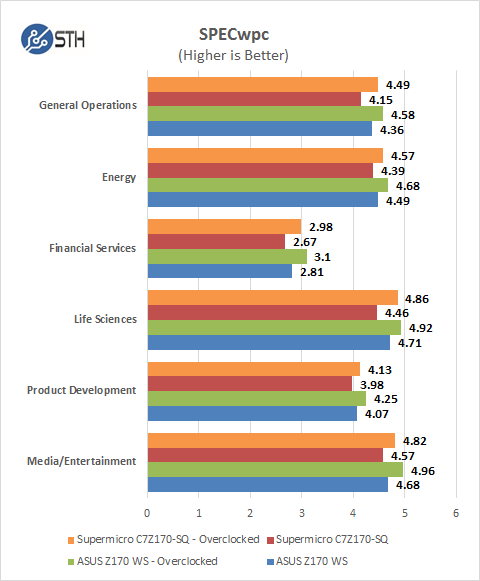 We do not see a huge difference between default and overclocked results but with these scores even small changes take a big performance boost which result in times saved on complex jobs. 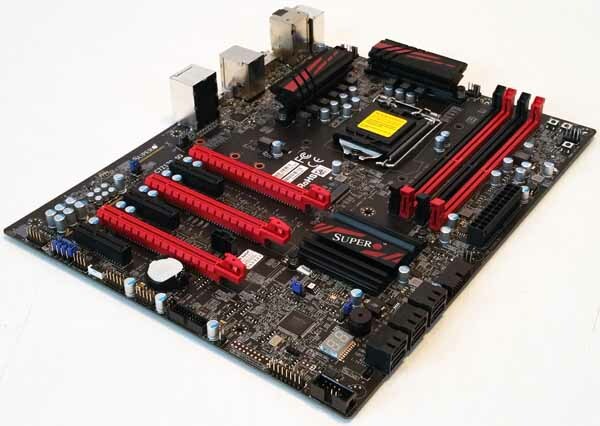 Our CPU2006 test results are close to other Z170 boards we have tested. For our power testing needs we use a Yokogawa WT310 power meter which can feed its data through a USB cable to another machine where we can capture the test results. We then use AIDA64 Stress test to load the system and measure max power loads. 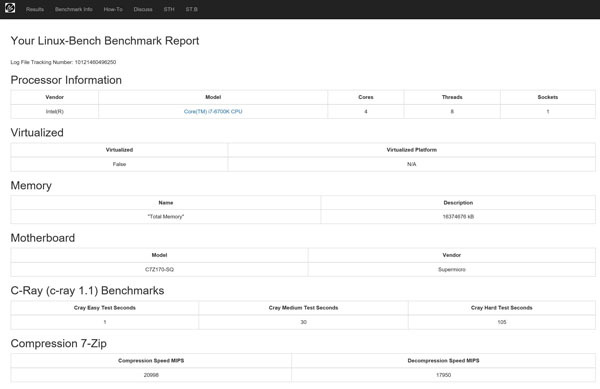 We ran our power tests with both default settings and overclocked. We see very little difference between these settings when booting up and general desktop use, perhaps 5-10 watts at best. 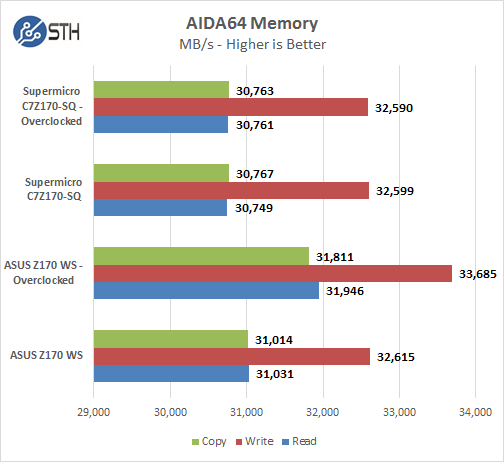 For our tests we use AIDA64 Stress test which allows us to stress all aspects of the system. At default BIOS settings we run just above 138 watts for a max load and then peak out at close to 150 watts with overclocked settings. 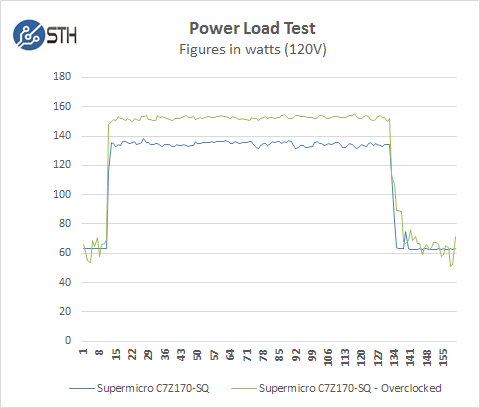 We really like the improvements Supermicro has incorporated into the C7Z170-SQ and hope they continue with these in other consumer and workstation motherboards. The C7Z170-SQ can keep up with performance of other motherboards in this class, it overclocks well, and has good performance. The C7Z170-SQ looks good enough to install in a gaming case with windows and perhaps even water cool it. It does have some short comings, lack of official SLI support limits us to a single NVIDIA graphics card but it can support AMD 2 and 3-way CrossFire. It also has a limited number of USB ports in the back with only 2x USB 2.0, 2x USB 3.0 and 1x USB 3.1 port. If you use a USB keyboard/mouse combo which is the norm these days, you are left with only 2x USB 3.0 + USB 3.1 ports for expansion devices such as printers. There are USB expansion headers on the motherboard that can boost that total to eight more. Using those would require either front mounted or rear mounted USB expansion adapters that are not included with the retail kit. 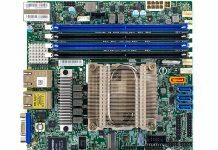 What you do get with the C7Z170-SQ is performance that matches other boards at an affordable price. Looks interesting. I’d probably go with the mATX little brother since I’m looking to go smaller, plus in a brief price check is about $50 cheaper. I bought it. It takes 12 seconds to load the bios logo and 28 seconds in total to show the windows 10 login. Performance? !